In recent times, price of no other thing has inflated as much as that of precious metals. Such has been the price escalation that one almost tends to forget that gold used to cost about Rs 6,500 per 10 grams in 2000. At present, the price of gold has reached astronomical heights and those in gold, silver and jewellery business are leaving no stone unturned to cash in on the yellow metal's appreciated price structure. Dust of gold whose price per 10 grams has crossed Rs 25,000 of late, naturally therefore, has substantial market value now. Many people across India deal in gold dust, which is proving to be a good business under the circumstances. West Bengal is no exception to the rule. However, what is intriguing -- about 5,000-6,000 people are dealing in gold dust in West Bengal for months along the Ganges in and around Shibpur area of Howrah district without any licence whatsoever. 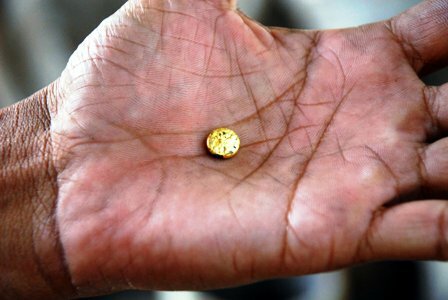 Click NEXT to know more how some people are making gold out of dust. . . 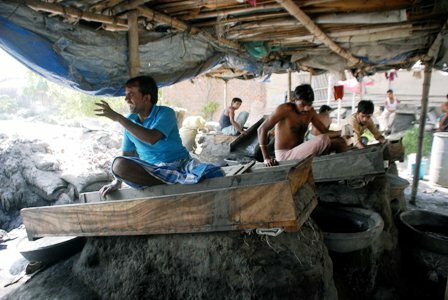 Image: Workers at Bengal shanties are busy recovering gold from gold dust. On a hot afternoon, we visited innumerable shanties across the Ganges in and around Shibpur in Howrah. "The business that thrives here is unlicensed and some of the returns reach the hands of some really powerful people," a reliable source had informed us. On reaching the site, we had no reason to disbelieve the source. We found hundreds of people sifting bags loaded with 'black powder'. However, none agreed to share their identities with us. For, each one of the workers knew that the business was unlicensed and disclosing their names and other details could prove fatal for their trade. "This is gold dust, didi", said one of them, busily cleaning the powder with a broom. while another person was mixing some liquid in a tub. "The powder will soon be poured into that liquid and made into a dough". Some of the craftsmen claimed to be working as independent traders, who bought the raw materials (bags full of gold dust) and sold 'recovered' pieces of gold to jewellery traders in Howrah and Kolkata without the help of any middleman. At least 90 per cent of the workers were Urdu-speaking Muslims mostly hailing from Bihar and Uttar Pradesh. Image: Gold dust is being treated with water. Recreating gold from gold dust is a rather complicated process. However, for our benefit, the workers simplified the description. Sacks of gold dust are procured from dealers in West Bengal as well as outside. Sacks containing gold dust arrive by road and also by water. The gold dust is first gathered and spread out to dry in the sun. It is mixed with water and made into a dough and then laid out to dry in the sun again. 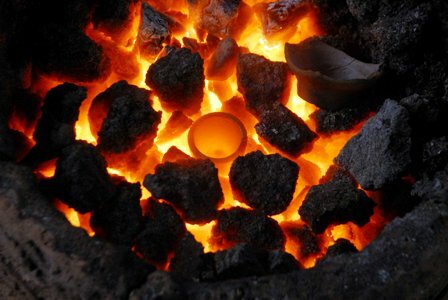 The dried gold dust is thereafter placed in a crucible (it is a container made of clay that is strong enough to withstand fire) and crushed and melted. Gold needs to reach a temperature of 1,064° C (1,948° F) in order to melt. 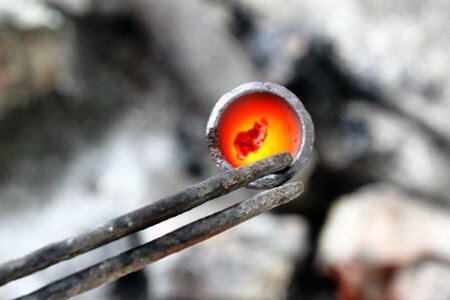 The flame is directed towards the gold dust and is held there until the dust turns into liquid first and then into a molten blob. The blob soon turns bright red and appear satin-like as it begins to harden. The gold is removed from the crucible with tongs and is placed on a charcoal block. The recovered gold is allowed to cool down and is readied to be sold. Image: After mixing with water, gold dust is being made into a dough. There is another simpler procedure for making gold from gold dust. In this procedure, the gold is hammered till it takes the form of sand particles. Then the gold is poured into a steel pot and water is poured into it. When the water comes to the boiling point, nitric acid is mixed into the pot containing gold dust and water. The concoction is left in the open and the 'impurities' evaporate. The same process is repeated twice. This way, what's left is 24 carat pure gold pieces. The second procedure is most suitable for rainy season when one does not get enough sun to dry the wet gold dust. Image: Gold dust is being sifted and dried. Just as the craftsmen at work at the riverside shanties were eager to exhibit their deftness in recreating gold out of dust, they were equally reluctant to talk about their 'rules of business'. On being asked several times, how do they manage to do business without any government licence, "we pay those who matter every week" was all the only information we could squeeze out. A roadside teastall owner, however had something more to add: "All these people are paying the most powerful people every week. It comprises a hefty cut from their income. Those people pay the municipality bosses who very conveniently turn a blind eye to the issue." This business started about 10 years back and has been growing steadily over the years, the man added. The teastall owner was also of the opinion that often smuggled gold bars from across the border arrived in these shanties and were crushed and mixed with gold dust to be circulated in the gold market of the state. Image: Gold dust is washed repeatedly with water. Most of these workers claimed that they worked as independent businessmen. However, there were some who said they worked in groups under the aegis of one midsize of or big trader and got paid at the rate of Rs 200-250 per day in lieu of 14-15 hours of service. Those working independently too earned almost the same amount daily but for them, the risk was more as they needed to source the raw materials on their own, processed the dust themselves and found buyers in the end. "However, if one works on his own, there is no fear of losing a job", said a young man in mid-30s. Image: Gold particles can be seen in this mixture. Raw materials or gold dust are mostly procured from gold traders across India. Price of each sack is determined rather arbitrarily. "Price of each bag is determined by the probable percentage of gold in it," informed one of the workers. Unwilling to quote the actual prices, the workers informed that if luck were in favour, they would earn Rs 200 a day at ease. "But at times, a processing fault could lead to zero productivity and fruitless labour", said a middle-aged man. 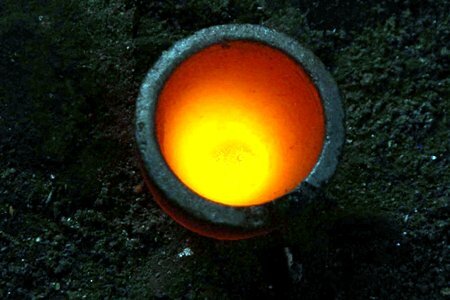 Image: Gold particles are being melted. The gold that the craftsmen retrieve are sold to gold dealers of Burrabazar, one of the principal markets of the state. "Generally, we manage to sell our product at the existing market price after a thorough scrutiny but at times, we get less if the buyer has some doubts about the quality of our product," informed an oldish man. 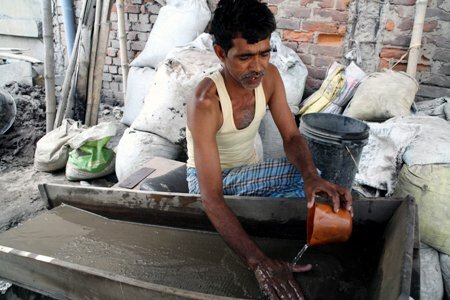 The workers who make gold out of dust toil very hard for 14-16 hours a day. They are barely equipped for such a tedious job. They wear no gloves or masks and have to withstand scorching heat of the burner for most part of the day. "Most of us don't live for long. We either get tuberculosis of lung cancer. 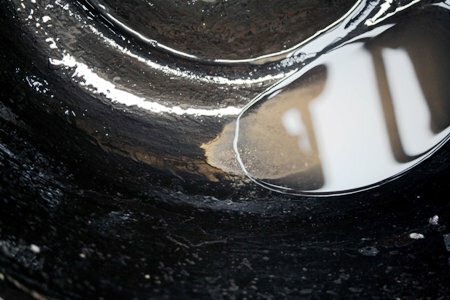 That comes from inhaling poisonous nitric acid that is used to process the gold dust," said a man as he made a vein attempt to cough out the toxic air that he consumed a while ago. Image: Liquid gold is being taken out of the chullah for cooling. Strangely, the state government officials said they had no idea that an unlicensed gold dust business was in vogue along the coast of the Ganges. Our repeated calls to the Howrah municipality on the issue went mostly unanswered. One of the officials, however, told us, "It's an impossible proposition. How can we not know anything about a business manned by so many people." When we asked him what his name was, he disconnected the phone with a curt, "We are government staff. We have no time to waste on some baseless media allegation." Image: A piece of gold recovered from the dust.